If you've ever been to an event at 23b Shop, you probably know Bobby, the loveable biker dude from a few doors down. Bobby has been to nearly every hacker potluck in the last four years, every single Sparklecon, and is always willing to lend a hand in causing some random mischief. Ever crank handles on our old Bridgeport mill? That came from Bobby's shop. Bobby isn't a hacker in the sense that he's writing bash scripts (although he's using Linux Mint as a daily driver, with a microwave bridge hooked up to our NAS device). Bobby is more of a life hacker. Bobby works on Harleys, a trade he learned from his Ex-Father-in-Law, Neal. Neal has operated a Harley shop in Orange County since the 70s. Neal is now in his 70s himself, and is falling apart slowly from Parkinsons and dementia. Bobby has taken it upon himself to look after Neal over the past few years, at immense personal cost. Bobby is Neal's full-time, unpaid care giver. Bobby has a heart of gold, and is self-describes as being "patient as a rock". Neal used to be a real bad dude, 6'4" of big mean biker gruff. Now, Neal is 98lbs soaking wet, hunched over, barely able to speak, requiring 24-7 live in care to help manage things like catheters, gastric tubes, showers, going to the bathroom, back and forth transportation to the local VA hospital for numerous procedures and appointments, and all sorts of things like that. Neal is also a stubborn old coot who would rather die on his terms in a motorcycle shop than rot away in a frog pond. Bobby does his very best to indulge Neal's wishes. They have to be out by the end of the month. The landlord denied a renewal of their lease on their Harley shop. This would be an inconvenience to anyone, for sure. Beyond the decades of accumulated stuff they have scattered about their shop, there's another complication. Their shop is also their home. Bobby has a bit of a Catch-22 on his hands. 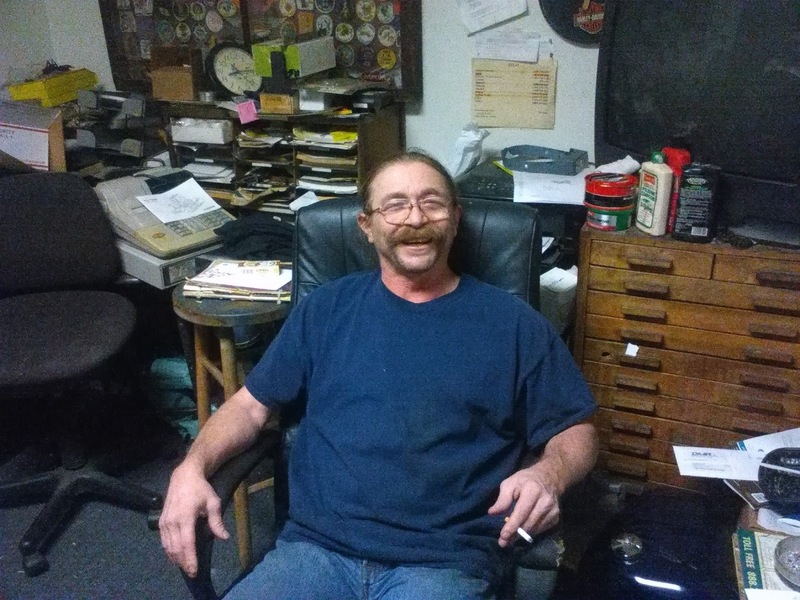 Neal would qualify for some more assistance through the VA if he had a residential address, but they live in a commercial space. The business doesn't make enough money to support an external residence, and Bobby has been spending so much time caring for Neal that no real meaningful work can be done in the shop. Bobby is the resilient sort, he will be fine and land on his feet somehow. It's how to take care of Neal that is the concern. Neal would be homeless were it not for Bobby, but it's beginning to look like that hand is being forced. Short of taking care of Neal myself which I am completely unqualified to do, I believe we can come together as a community to give Bobby a little monetary boost to help him in his time of need. He has some good stuff in exchange as well. 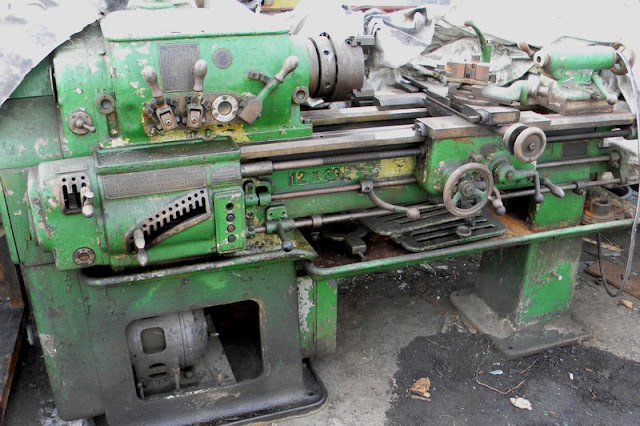 Neal's big old Hendey lathe is for sale. This lathe is a BIG boy, a very fine example of machinery worth preserving. I'd like to get Bobby a good price for this lathe and move it over to 23b Shop. That money would be enough to foot the bill for an apartment for a month or two, long enough for them to get on their feet and the wheels cranking for VA benefits that would apply to them now that they would have a residential address, or to find Neal more permanent skilled care and free Bobby so he can find work himself. The lathe that is currently in heavy rotation at 23b Shop would be moved to Mag Lab as a hand-me-down, but still a quite excellent machine no less. There's even a whole slew of tooling that will come along with both machines, so no one leaves empty handed. I've already worked out the details with Trent and Arclight, this plan is a go once we put some much-needed cash in Bobby's hand. I started out at 23b Shop on the lathe. All the success in my adult life I owe to the things I've learned at 23b, and I'd like to give back to you guys. If anyone donates $100 or more, I'll make time to teach them a half-day, hands-on lathe class at their hackerspace of choice. I also do 3D CAD, 3D printing, 3D scanning projects, services and lessons as well, all of which I'd be happy to exchange for donations toward this worthy cause. Anything helps, cash is best since bikers don't really do Bitcoin, but we can certainly take a Paypal donation in their name. Let's make this happen by this month's Hacker Potluck on February 20th. Can't make a monetary donation, but are able to lend a hand? We'll need a few strong backs toward the end of this month to help sort and process and package their inventory before it gets sent off to storage. Perhaps someone out there has some insight to social services that we aren't aware of that would make their challenges less painful? By helping Bobby and Neal, we also can up our own game and hack better by putting more of Neal's good old machines back in the hands of hungry hardware hackers, where they will be loved and fostered as their original owner fades away into the inevitable, never-ending night. Hey! Remember me? Your friendly 23b Paypal donate button? From back at the beginning of this post? Well if you feel so inclined, please do click on it now. All of us here at the 23b shop will greatly appreciate it if you are able to give.